Hummingbirds are among the few birds capable of inspiring equal fascination among birders and non-birders alike. No other bird looks like them or flies like them. These charismatic and fearless tiny birds have captured the imagination of people around the world. Is it any wonder then, that there are whole gardens created around attracting and keeping hummingbirds coming back year after year? People don't usually think of hummingbirds as pollinators, but they are among the worlds most efficient. Plants from wildflowers to trees benefit from these pint-sized pollinators. Hummingbirds have no sense of smell; it is color that they are most attracted to. If you want hummingbirds, then lay out the red carpet. Planting flowers that are red is like putting out a neon sign that says “Open Buffet!” The shape and color of familiar plants like Cardinal Flower, Trumpet Creeper, even Fuchsia and Christmas Cactus are due in large part to their relationship with hummingbirds. 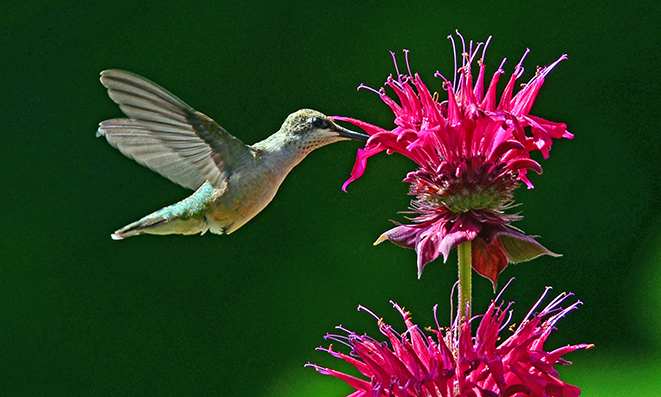 Gardening for hummingbirds generally requires less intensive management than regular gardens. Most native plants that are adapted to local soils and rainfall will thrive and bloom without fertilizer. Please avoid using pesticides or harsh chemicals as these greatly impact their tiny hummingbird systems. You say you have a brown thumb? Or a home without a yard? Don't worry; you can attract hummingbirds with a hummingbird feeder and sugar water. A solution of four parts water to one part white table sugar is simple to prepare and economical too. Sugar water is remarkably similar to the natural nectar found in hummingbird-pollinated plants. The most important thing when feeding hummingbirds from a feeder is to keep it clean! They should be cleaned and filled with fresh sugar water every two to three days. No need for soap, just hot, hot water. Mold is one of the top killers of hummingbirds. If ants become an issue they do make ant baffles but smearing some petroleum jelly from the top of the hanger will prevent them from taking over. Contrary to widespread belief, leaving feeders out in fall will not cause normal healthy birds to delay their migration. It might even help those that got a late start on their migration.